If you’ve ever ordered Korean fried chicken at a restaurant before, you might have been served this pickled radish, called chicken-mu. 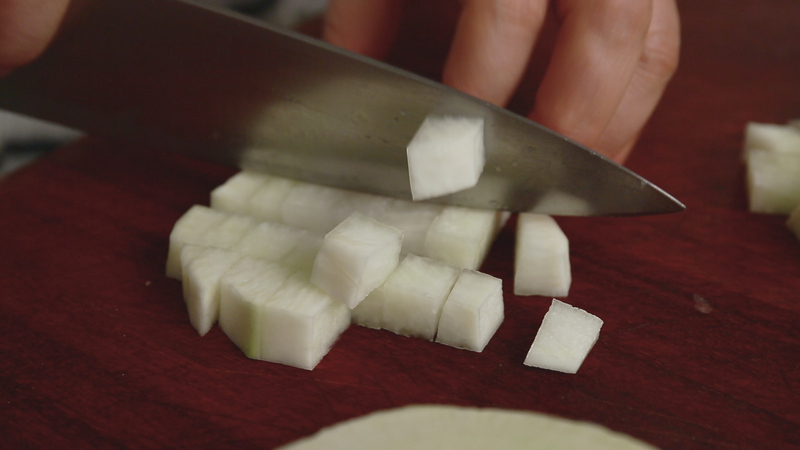 Tiny cold radish cubes, pickled in sweet, sour, and just a little salty brine is very refreshing when paired with super crispy Korean fried or roasted chicken. The recipe is so simple and easy, which is one reason I didn’t make a video about it, until now! But I’ve been asked about it so many times I decided to make a video for my lovely readers. I remember one time in Toronto, and another time in Los Angeles, people recognized me and right after saying hello, they asked for this recipe. I told them it was easy and explained how to make it, but they preferred a video instead of my live explanation! Combine sugar, vinegar, salt, and water in a large bowl and mix well until salt and sugar are well dissolved. Add the radish and stir a few times and transfer to an airtight container or a glass jar. Keep in the refrigerator at least 2 hours before serving. Posted on Thursday, February 1st, 2018 at 7:47 pm. Posted April 1st, 2019 at 4:48 pm | Log in to reply. this recipe is also great for mu-ssam! So good with samgyupsal! For the water in the recipe, I used the leftover water after boiling beets, and got this great color! Posted March 24th, 2019 at 3:08 pm | Log in to reply. Made it again yesterday for my husband’s birthday party. I reduced the amount of sugar to 2/3, cut the (unpeeled) radish into very thin slices via machine and also used only half the amount of water. Still a bit too sweet for my taste, but delicious nonetheless! Everybody loved it. It goes very well with mackerel, too. Thank you for your video how to gut them. They were rather small this time, but fresh as usual (Turkish supermarket at the corner). Posted February 21st, 2019 at 3:02 pm | Log in to reply. Posted November 29th, 2018 at 10:44 pm | Log in to reply. Thank you so much for this! I have never had this from the Korean restaurant we go to. (There is only one good one, and it’s over an hour to drive to get there!) Their food is delicious though and I fell in love with their kkakdugi, especially. Since discovering your videos though, I just make it at home, along with so many of your recipes. I’m going to take some Dakgangjeong to a Christmas party and was going to take my kkakdugi until I saw this recipe! I did it just a little different, though, I hope you approve! I cut my radish into strips, then added a little carrot and some green onion for extra flavor and beautiful holiday colors! What do you think? Thanks again for your website and videos! My husband and I have never eaten better. Home cooking is so much more delicious! Posted December 2nd, 2018 at 9:32 am | Log in to reply. Yes, home cooking is the best! I love your holiday chicken-mu, you are so creative! I hope everyone enjoys your food at the party! Posted May 6th, 2018 at 12:55 am | Log in to reply. I used taikon, and it’s really bitter to the taste, what was wrong? Posted March 13th, 2018 at 11:47 am | Log in to reply. Reduced salt to 1 teaspoon and used cane sugar instead. Very crunchy and delicious. Posted March 2nd, 2018 at 5:31 am | Log in to reply. These pickles are so delicious! I’m already into my third batch, and I tried once with daikon, but Korean radishes are so much crispier I’ll stick with Mu! I ran out of white sugar for my last batch, so I made it with dark brown sugar, and the color is not too appetizing, but the taste is even more heavenly! Thanks again for all these wonderful recipes! Posted February 10th, 2018 at 1:39 am | Log in to reply. I make mine a bit differently but the flavor is close. Weep the radish in salt and sugar. Then stain it with turmeric. Give it a quick rinse and cover with the brine. Posted February 17th, 2018 at 2:01 pm | Log in to reply. It looks gorgeous yellow! I see a few whole black peppers in there, awesome! Posted February 18th, 2018 at 9:58 am | Log in to reply. Yes, i add a few whole peppercorns and 1-2 whole dried chili peppers. Both are optional of course. I make it with nappa too. Posted February 4th, 2018 at 1:56 am | Log in to reply. I have never seen Korean radishes at our local Asian market. I was wondering if daikon woukd work as well. Posted February 17th, 2018 at 2:35 pm | Log in to reply. Posted March 2nd, 2018 at 5:38 am | Log in to reply. Posted February 2nd, 2018 at 12:05 pm | Log in to reply. you mention 1/3 cup sugar.. but from the video.. it is 1 cup. can you please explain? Posted February 3rd, 2018 at 9:49 am | Log in to reply. If you watch back she does say “one-third cup sugar” so 1/3 is correct. Posted February 2nd, 2018 at 8:45 am | Log in to reply. Hi! Love your recipes and cookbook! 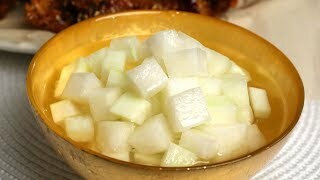 I’ve always wanted learn how to make the radish kimchi that is served at Seollungtang restaurants too, love that taste! Would you also have a recipe to share for that? Posted February 4th, 2018 at 1:05 am | Log in to reply. Posted February 4th, 2018 at 1:31 am | Log in to reply. Hi Maangchi! Yes!! I’ve tried this recipe previously and loved it, but i cannot recreate the type of special radish kimchi that is served in Seollungtang restaurants, it taste different from the normal radish kimchi. I can’t really describe it but but it’s a little sweeter, tangy and just goes sooo well with Seollungtang as compared to normal radish cube kimchi … Was wondering if there was a special recipe for that or does it have to do with the fermentation time …? Posted February 18th, 2018 at 1:51 pm | Log in to reply. I googled with korean for special recipe. The secret recipe for Seollungtang kimchi is adding a ‘Yakult drink’. It will add that sweetness and tangy taste. I hope it helped you. 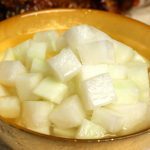 This recipe was originally posted on February 1, 2018 at 7:47 pm by Maangchi. The video was watched 482,392 times on YouTube & has 13,178 likes!